Rocky Mountain Landscapes, Summer Wildflowers, and Charming Towns from the Centennial State. After summiting Redcloud and Sunshine, two of Coloado's 14,000' peaks, I was on the downhill side of the hike when I paused to capture these colombine with the San Juan mountains rising in all directions around me. This path, the Silver Creek Trail, is west of Lake City and provides great views while ascending two of Colorado's prettier peaks. The wildflowers along the way were an added bonus. Photo © copyright by Rob Greebon. 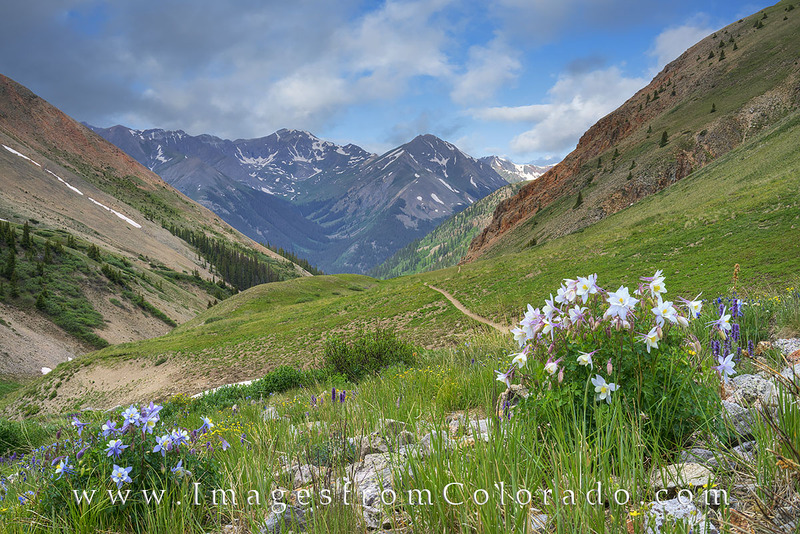 I am a professional photographer who loves spending time in the Rocky Mountains of Colorado, and I specialize in landscapes, wildflowers, and city skylines. I hope you enjoy your time perusing my website. Whether for commercial or private use I'd be happy to work with your print needs. I offer standard archival prints, images on metallic paper, canvas, or metal, and we can work together to bring you exactly what you want. If you have any questions, please contact me. Please visit my Licensing page for more details.